Hydroponic farming is a relatively new way to grow plants that is becoming increasingly popular. The main benefit of hydroponics is being able to grow the plants with the most optimized and efficient way possible by controlling everything that affects the plants' growth such as the air, humidity, nutrients, water, and the temperature. Because of this complete control, consumers can know exactly what they’re getting when they buy hydroponically grown food. There are no hidden pesticides, which according to Ruifa Hu of the Beijing Institute of Technology, negatively affects the “nervous system, white blood cells, liver, blood cells, and kidney”. Another key component in the popularity boom of hydroponics is the ever rapidly growing population of the world. Freedom From Hunger estimates that there are more than one billion people in the world who don’t receive enough food to be healthy. That’s more than 14% of our global population that is going hungry and their health is adversely affected because of this. One of the major contributing factors of this chronic hunger is due to the export of crops from the nations that need them most. Contrary to what many believe, Asia is struck with the worst hunger in the world. The growth of the Asian megacities, that is a city of more than ten million citizens, contributes to the drain of crops from impoverished regions. Many believe that hydroponics is the best way to make these megacities self-sustaining. The world’s largest indoor factory farm is located in Sendai, Japan in an ex-Sony factory which has been converted for hydroponic use. The master mind behind it, Shigeharu Shimamura, designed it along with his engineers to produce lettuce using just 1% of the standard amount in conventional farms and at growth rates that are 2.5 times faster than traditional farms. It produces more than ten thousand heads of lettuce in just one day, every single day of the year regardless of the weather. What’s the most incredible part? It does all of this on just half of an acre. This truly is a revolutionary way of growing food. The world’s population is still growing at a terrifyingly fast pace, and if we can’t properly feed more than 14% of our population right now, what in the world are we going to do when seven billion becomes ten billion? Or even fifteen billion? The fact is that we are absolutely going to need to find new, faster, more efficient ways to feed our people. Now, I’m far from a CEO of a Japanese company. Truth be told, I’m neither Japanese nor a CEO. One thing that Shigeharu Shimamura and I have in common, however, is the belief in the future and in a greener world. The world’s commercial farms dump their pesticides, herbicides, and insecticides into our ground water and in turn into our drinking water. Commercial farms use way more water, fertilizers, chemicals, and land to make what is simply put, sub-par food at the cost of our environment. I don’t believe that’s right. Especially with the advent green energy such as wind and solar power, the benefits just outweigh the damage we’re doing to our planet. The first step in creating your own hydroponic setup is getting all the materials needed! There are countless different types of setups, but the type I made is called Deep Water Culture, or DWC for short. It's typically the simplest form of hydroponics and it works by holding the plants just above a nutrient infused pool of water. Without going into too many further details right now, here's the list of items needed. Alright now that we've got this out of the way, let's talk about these parts a little more and discuss their uses and alternatives. Your Container. 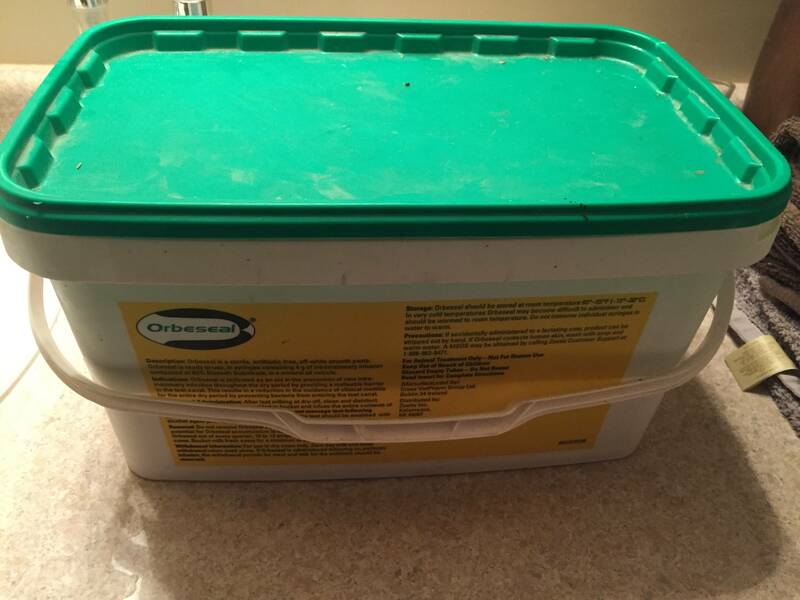 I used a plastic container that was previously used to hold cow supplies that I had hidden in my garage. You can really use just about anything that will hold water. Many people use 5 gallon buckets due to their ease. One necessity of the container is that it must be opaque. The reason behind this is to reduce any algae buildup, which I learned the hard way grows very fast. Upon discovering I had problems with algae I completely wrapped my setup in duct tape to reduce the incoming light. I've heard that spray painting the container a dark color also works but that it can flake off after a little wear and tear. Nutrients. This is, in my opinion, by far the most complex part of hydroponics. Plants all need nutrients to grow. There are dozens of different fertilizers but I decided to go with Sensi Grow because of its lack of pH checks. Most other types require you to regularly check the pH levels of the water and to make any needed adjustments. With Sensi Grow, no additional checks are needed. Seedlings (or sprouts). The fun part! How to decide your plant? For simplicity's sake (and a due date), I chose this gorgeous cultivar of lettuce. Nearly any plant can grow hydroponically but the most popular types seem to be lettuce, tomatoes, basil, and strawberry. I chose lettuce to do due to its short growth length (55 days). Light Source (Sun or Lamp). I initially planned to use sunlight only for my plants. I had them directly beside a south facing window where they received more than 9 hours of light every day. Still, within one week the plants were strongly reaching towards the sun so I broke and bought a light. If your plants can grow in just sunlight, I'd recommend using it but otherwise a lamp works great too. Air Pump. These are used in Deep Water Culture setups to give oxygen to the roots. The common misconception of "over watering" plants isn't truly giving them too much water, it's washing away all the oxygen the roots receive! The air pump will bubble oxygen right into the roots. Air Tube. This is a simple part that just moves the pushed air from the air pump and to the air stone. The one I bought and used was black and opaque but I don't believe the effects would be noticeable for a transparent tube. Air Stone. This goes hand-in-hand with the air pump. Their purpose is to produce the individual bubbles that carry the oxygen to the plant. Net Cups. Net cups are small plastic cups that have a lip around the top. The bottoms of the cups have small openings that allow water to move in while letting roots to grow out. There are different sizes for different plants but for a lettuce plant a 3" cup works perfectly. Starter Plug. This is a material that fits nicely in your cup and allows the seeds to grow. I was given a sponge material for free but after researching online it appears that rockwool seems to be the most used. Growing Medium. There are many different mediums to use; I used coarse gravel that was also given to me but, again, it appears that most people use expanded clay pellets. The growing mediums provide something for the roots to grab onto and provide support to plants. Small Fan. A fan will circulate the air around the leaves and bring in more carbon dioxide. It also strengthens the leaves and stems by applying pressure to them. I used a small desk fan a few hours a day but some run theirs all day, or don't have any at all. When you plant your seeds it's best to put 2 or 3 seeds in each starter plug. You must keep the growing medium very damp which in bright sunlight can be difficult to do. I put a small piece of plastic over the cups to help keep moisture in but within a few days I was forced to cut a small hole in the plastic to allow the seedlings to continue growing. After 4 days I transplanted my plants into my Deep Water Culture system but I'd advise you to wait 6 days to really grow the roots out first. After 4-7 days it's best to transplant your seedlings into you Deep Water Culture system. As I said before, I did it after 4 days but I'd recommend waiting a couple more for best results. The first step you want to take is to drill your holes for your net cups. I lacked the tools so my local hydroponic store drilled them for free for me. You want the holes to be an equal distance apart from each other but not too close to the edge. You also want to drill a very small hole for your airline tube. After, fill your net cups about one-third of the way with your growing medium. In my case, gravel. Take the starter plug and put it right on top of the gravel you just placed in the cup. Fill the rest of the cup all the way with gravel to hold it securely in place. You want to completely cover up your growing medium to minimize the light that reaches the roots. Connect your air pump, air tube, and air stone. Put the air stone and some air tube through the hole you drilled. You may have to weigh the air stone down somehow to prevent it from floating up. I used a rock and rubber band. Next, fill your container. Take note of how much water you put in. Don't fill it to the top, however. Stop when the bottoms of the net cups are submerged by less than half an inch of water. Using the notes of how much water you used, put in the amount of fertilizer you need. With Sensi Grow you put in one tablespoon of both Part A and Part B per gallon. My container held 2 1/3 gallons so I put 2 1/3 tablespoons of each bottle of nutrients. Put your three net cups (which should be holding your plants) into the three holes drilled out. This is also a good opportunity to thin out your plants. When you initially planted your seeds you put a couple seeds in each starter plug. There should, in turn, be a few plants in each plug. It's best to remove all but the strongest plant in each starter plug. You only want one plant in each plug to prevent them from competing for nutrients. Most Deep Water Culture systems require regular pH checks and re-balances of nutrients to achieve perfect pH levels. With Sensi Grow, the only maintenance is a weekly "flush" of nutrients. Every week, you have to take apart your system and dump out the nutrient water. You then must refill the water and nutrients. After that, you're done for the week. There's very little work involved. If you're anything like I am, you're very likely going to find some issues with your grow system and you'll need to make some adjustments to fix the problems. Hydroponics and agriculture are both very complex and there's dozens of ways that they can go wrong. I ran into several and I'll explain them to you and how I adjusted to combat the issues. Reaching Plants. I found within days of planting my seeds that the seedlings would grow almost 90° straight towards the sun. This indicates that the plants are not receiving enough light. You can try to put them somewhere where they will receive more light, but in my case there was no other option. I had to buy a lamp off of Amazon but after that my plants stopped reaching so much and their growth was extremely noticeable. Slime in Your Container. This is algae growth. When I first started off I didn't duct tape my entire container and algae grew strongly in my container. It's usually on the bottom of the container, but some grew onto one of my net cups. I talked to my local hydroponics expert about it and he advised pouring a small amount of hydrogen peroxide to kill the algae and to finish duct taping the container. Weak Plants. There are several causes for weak plants such as low light, too little nutrients, and algae. My plants were weak because of both low light and the algae buildup. To combat the algae I used hydrogen peroxide like I described before. For the low light, I discovered that I had my light too close to the plants and that it was actually focusing the vast majority of the light towards the middle plant and very little to the outer two. I made a wooden stand for my lamp that would raise it about 6" higher than it was to help distribute the light more evenly. I also made "stands" out of some paper I had laying around to help the plants stand. My two outer plants never really recovered from the lack of light. They've continued to grow but they're definitely stunted and far behind the strongest plant in terms of growth. As with any type of agriculture, there's a long wait for hydroponics. From planting to harvesting, it took fifty days for the lettuce to mature. The joys of Deep Water Culture hydroponics is that aside from the weekly nutrient change, there's practically no other work to put in. The big day: Harvest Day. In the days leading up to Day 50, I noticed several lower leaves were wilting on my biggest plant due to the biggest leaves blocking the light from reaching the smaller, lower leaves. I decided to harvest the biggest leaves of the plant. I tore off the wilted leaves and tossed them out as they weren't edible and kept the rest of the outer leaves. I left the very inner leaves of the plant that were curled inwards very tightly intact. Some people decide to harvest the entire plant at once and that's fine, but I wanted the plant to survive and continue to produce good leaves. The outer leaves of one plant were easily enough to split between my girlfriend and I. Hopefully, the other two "runt" plants will catch up. I left them directly under the light and after a few days they appear to be growing. The harvested plant is still growing and the inner leaves are beginning to spread outwards. Hydroponics truly could change the world. If every family grew just a couple plants inside their house or garage, we could cut down pesticide and herbicide use dramatically, reduce water waste, and produce our own food. The world has seen advances in communications, space travel, and technology; perhaps agriculture is ready for a complete change too. i like mini setups. they are the best. thank you for sharing such detailed post. you can easily attach a custom light on top of your box, are you familiar with my work ? I'm not but I really like how you connect the lights to the plant pots. Keep on making guides; they're good. I'd like to try kale, but i don't understand one thing: any particular bulb or type of light? Can a regular led bulb do the work, or do i have to go to a grow store for expensive lighting? Any bulb should be fine if it puts out enough light. My LED light is partially blue and partially red to hit the wavelengths that lead to the most plant growth but many use common lights that work fine, too. Here's a good resource for some more information. Fresh lettuce in the winter. Oh yeah!